We’re on the last train heading home after a screening in the London Korean Film Festival, after a pell mell dash across central London to make it in time. 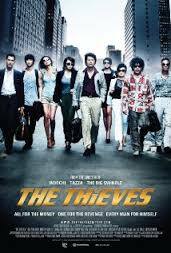 The film was The Thieves, a kind of Korean Ocean’s 11, shown at the Leicester Square Odeon, and it was excellent. SY suggested we go see a K movie, and let me pick which one. I didn’t have very high expectations, but The Thieves totally smashed it. 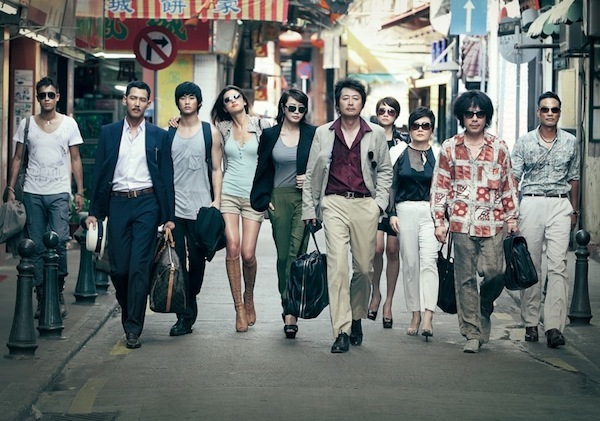 It’s a long movie (135 minutes) set around a diamond heist from a notorious gangster in a major casino in Macau. So far, so blah- but the heist is just the mannequin, the real joy comes in the clothes that sit atop it. Call it the voice of the movie- it’s like Ocean’s 11 with its complex clockwork heist maneuvers and tense safe-cracking moments, like Fast and Furious for outrageous stunts down the side of buildings, but it is very much its own animal. First up there’s its Asian nature. Though characters have names like Pepsee and chewingum and Jonny, and the characters sometimes speak English (to much laughter), it is deeply rooted in Asia. Where James Bond may go to Macau for exoticism- for these folks it feels like their back yard. They fit in in ways Bond never could. They speak the language- a constantly shifting tapestry of Korean, Chinese, Japanese and yes English. There are jokes that rely upon knowing they’re speaking Chinese now, or Japanese, and just how they’re saying it- subtleties that folks from the locale will completely get as part of a kind of pan-Asian uber-culture, but which we Brits, Yanks and non-Asians generally will be left blank-faced at. Cooler than you probably think this looks. It is damn funny. I laughed at the expression of the handsome young boy on wallet-stealing duty while the hot girl distracted the mark, only to find out the mark only had eyes for him. His face was priceless. The action too was seamless- like the moment one of the main characters gets hit by a car, then gets up. It was shot so smooth, and there had to CG involved, but you couldn’t see it all. It looked real. There were shootouts, and car chases, and double-crosses, that just kept on piling up on top of each other in a way that could be fatiguing but in this just made me laugh and buckle in for more- as each one was fresh, and the costs were real. It’s not often in a Fast and Furious movie, for example, that there is any cost. But in this one several beloved, sweet crooks die. A handful get arrested. Almost everyone gets shot at least once- and there is no real bad guy (except the main bad guy), so you don’t know until close to the end who even is the real hero of the piece. There’s twisty backstory, and backstabbing within the group. Everything shifts a few times. Most of all, it’s just good fun. It makes me want to learn Chinese so I can get the in-jokes fully, and double down on Japanese and Korean so I can get those too. When is the sequel? I want to spend more time laughing with and being thrilled, romanced and surprised by these characters.